Mt. Qingcheng in China - a place of solitude. Cheng Wang Photos. The noises and chaos of the day intrude into every minute of our lives—whether awake or asleep; it has become essential, for many people, to retreat to an idyllic place to cleanse their minds and, hopefully, nourish their souls, myself included. Lao Tzu (571BC-531BC), the founder of Taoism, has shaped the lives of millions in the East with his book, Dao De Jing. 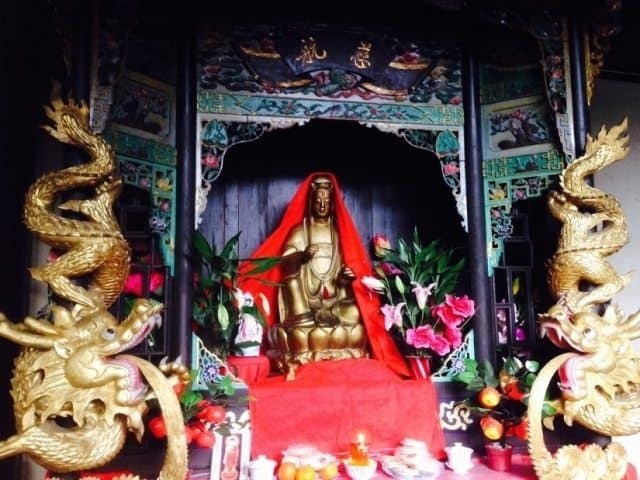 Many Taoist temples in China are today’s best-preserved historical sites. Fascinated by Lao Tzu’s ideals throughout most of my life, I chose to visit Mt. 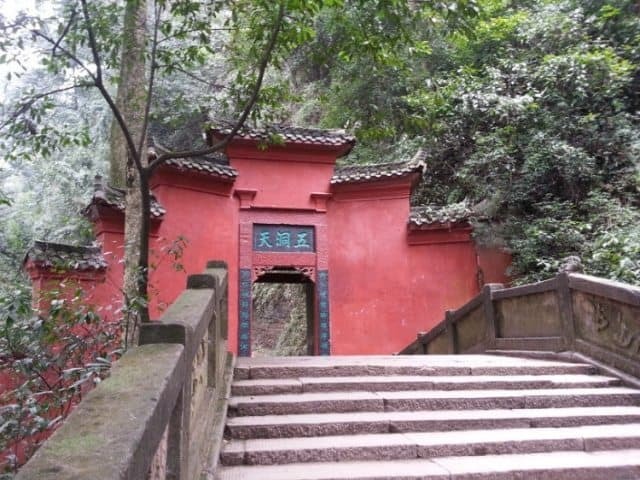 Qingcheng, one of the most important intellectual and spiritual centers of Taoism since the 17th century. Before entering into this mystic world, your flight has to arrive in Chengdu, the international airport nearby and the capital of the Szechuan province. 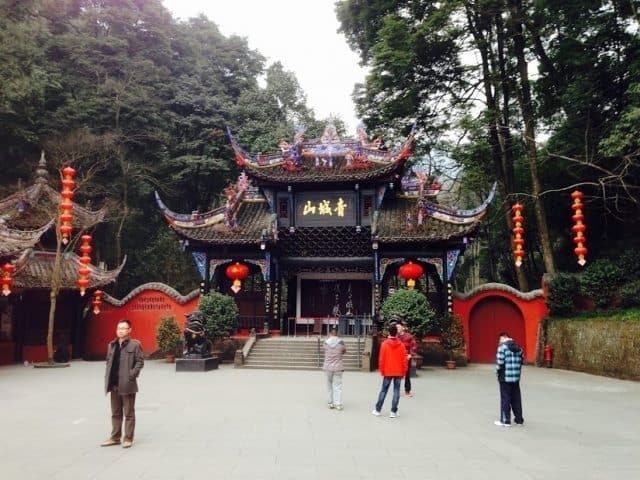 The city of Chengdu is home to many temples and beautiful structures. Yes, it’s the origin of the most famous Szechuan cuisine, but you can forget whatever you know about this food you’ve tasted all over America; and you will rediscover it yourself. If food alone has not hurried you in getting on the road, here is another. Chengdu, rated the best Chinese city to live in for several years in a row, is nestled in dark, intense, green mountains. It has a rich history and culture far different from other major cities in China because of its unique geographic location. Along with the food, it has nurtured an equally “spicy” disposition in its people. 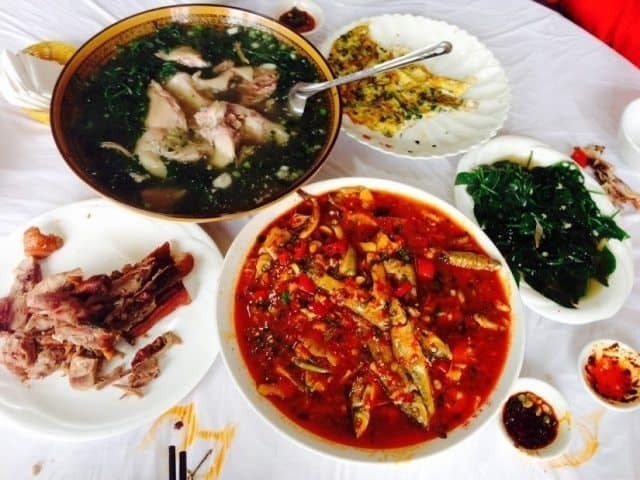 Chengdu is home to some of the most famous Szechuan cuisine. In most urban cities in China today, riding in a taxi could literally cause the faint-of-heart to faint. Imagine that stoplights are merely a suggestion, and driving along the center-line to save two minutes with oncoming cars zooming at you is like a scene from Fast and Furious. But in Chengdu, taxi drivers, often the first local people you will interact with, appear more at ease than you are. I hired a cab on my first day for a quick tour of Chengdu. “宽窄巷子 ” (KuanZhai XiangZi, or Wide and Narrow Alley). I told the cab driver where I would like to go: the most well-known food street in Chengdu and beyond. “That’s a great place to visit for its history and spectacular scenes,” the driver conversed back, as if he was talking to an out-of-town friend, “but try not be tempted by all the food you see”. 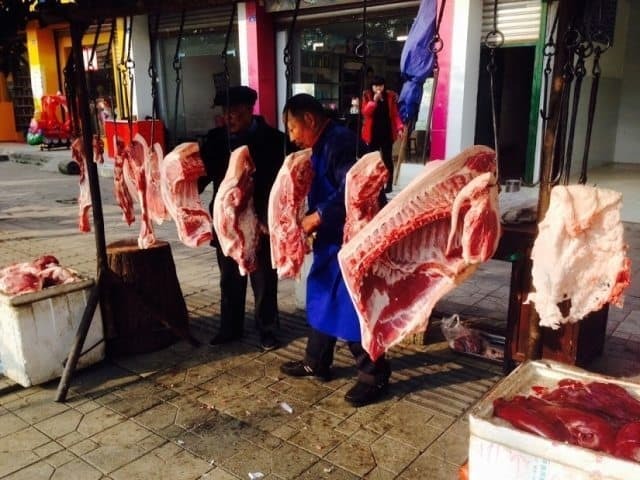 A meat market on the streets of the city. I was delighted by the driver’s witty common sense, but more so by his zesty style. 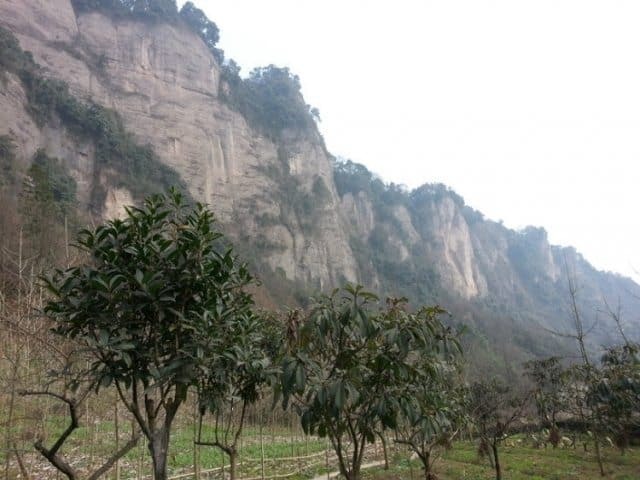 Depending on the agenda, there are unlimited ways to feel amazed just by staying in Chengdu, but my mind is on Mt. Qingcheng this time. There is a bullet train that departs hourly during the day; however, I chose to drive a rental car, arriving at my friend’s unoccupied condo on the foothill of Mt. Qingcheng in 50 minutes. This short drive on the gleaming highway felt like a time machine trip back a hundred years, from a city of 14 million people to a tiny village surrounded by dragon-like mountains in its distance. Stepping out of my car, I wondered if my ears might be malfunctioning or how the noisy universe, as I knew it, had completely shut down. My eyes followed the sight of century-old, mud-covered houses sporadically placed on the horizon, where white smoke emanating from the chimneys curled into the clouds. I realized my journey had finally begun. 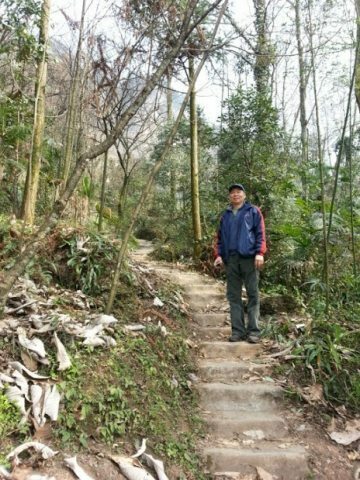 Cheng Wang on the pathway up the mountain. I got up early the next morning, bursting with excitement, to the scent of dewy spring and wild flowers seeping in from every pore of the house. I was quickly on the road and just about the first one at the main gate of Mt. Qingcheng when sunrise caressed the mountains and valleys with its gentlest light, like a loving mother stroking her hand through her little boy’s hair to wake him up. Having parked the car, I walked towards the ticket booth. A middle-aged man with a suntanned face waved his hand at me. 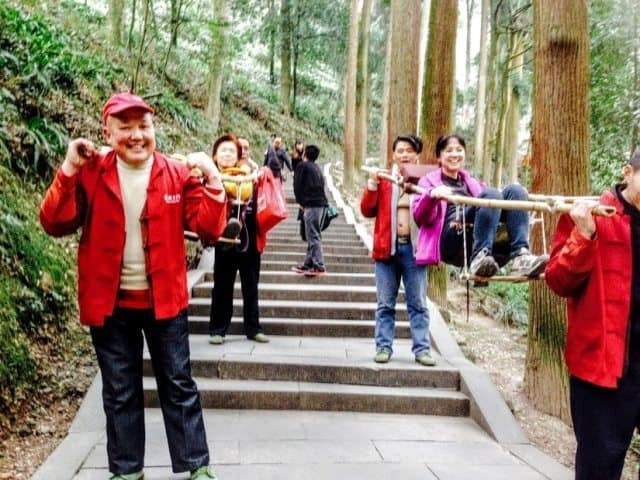 “I can take you up by the other route at 60 yuan (US$10.00) or you will pay 90 yuan here.” He made a clear sales pitch with his hand pointing to the peak of Mt. Qingcheng. “Is that legal?” I asked without hesitation. “How about 45?” Haggling is a part of the formal process for any informal transactions in tourist locations. We walked across a street to a parking lot, where a local young man was waiting by his car. We were quickly on our way, like being late for a flight. Tourists and locals being carried down the trail in these unique contraptions. Our car went onto a very narrow road with about one foot of buffer on both sides of the broken brick wall, and it was going uphill with many sharp turns. He drove like 007 being chased, shifting gears frantically, leaving a cloud of dust behind. “This road has a history of several hundred years; my great grandfather started to live in this village.” He raised his forehead up front pointedly. “Hundreds of years ago? This road must not be built for automobiles.” I tried to keep up with him, “I’d rather take a donkey cart next time.” And this is a serious statement. No glamorous gate for such a famous place? Well, there was no ticket booth either, only an old lady sitting on a stool selling bamboo hiking sticks: 5 yuan each. That seemed to mark the start for our pathway ahead. There were about 5-6 people lined up like me, ready to go. The temples are a place of worship for many who visit. It was a fair spring morning, crisp and clean. We kept our own pace around this small group of people, for much of the time we could barely see or hear each other. Clattering sounds coming from tree branches tapping each other in the wind, a kind of game they were playing tirelessly, with birds to occasionally cheer them on. The mountain stood straight up like a wall, I had to throw back my head and raise my eyes vertically to capture the full view. My two feet were moving rhythmically on the uneven stone slabs laid here hundreds of years ago; my mind was mesmerized by the solitude. From this ambiance came silence and awe. Another old lady sat on the roadside selling similar bamboo sticks, marked up to 20 yuan each now at an attitude of 2,000 feet higher out of 4,134 feet at the peak. I suddenly heard talking noises ahead of me. Coming closer to the commotion, there were about 15 people standing around our broken road, with a 15-foot drop-off. A sign indicated that it was caused by last year’s earthquake. There was a heavy rope for us to pull ourselves up one at a time. It did not appear too daring for me, but a few women and children looked puzzled. I helped push 3 kids up, and then came my turn—uneventfully. My early memory of this half-priced transaction had a somewhat different flavor now; nevertheless, it was more an adventure to me than an inconvenience. Rooftops of the first Taoist temple finally emerged against one side of the cliff. It was magnificent when seen from afar, but showed a clear lack of upkeep with windows barely hanging on the hinges and paint peeling off. I was thrilled, like stumbling on a rare ancient gem and the whole site felt completely original to me. I pushed open the squeaky heavy wooden door, and a dense smell of dusty humidity extended to my nose. The grand hall was two stories high with 5 huge wooden pillars supporting the ceiling. It was the massive solitary empty space that bestowed a breathtaking and humbling effect on me. Another two hours later, after I meandered along the official path, our small group of “rebels” joined the river of people everywhere to marvel at 11 more shining temples throughout the mountain. Somehow, the image of the first rundown temple, with its tranquility and grand open space, stuck in the mind. After my daylong immersion, I walked over to a household eatery and sat down for a cup of tea, made from freshly picked tea leaves from the nearby mountain. I waited for my chicken dish, made from chickens running around in the backyard ten minutes ago. Wouldn’t it also be true that the empty space inside ourselves and what we’ve placed there makes us who we truly are? Cheng Wang grew up in China during the 10-year Cultural Revolution. 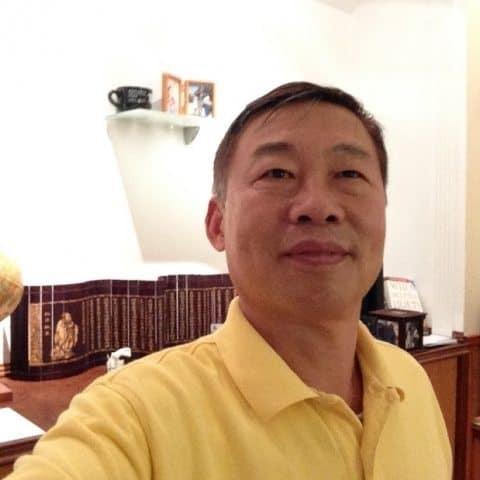 He moved to America in the mid-1980s where he received his PhD in Economics and became Principal Member of Tech Staff for AT&T, where he has been for the past 18 years. Cheng believes writing is the last Everest to conquer and he is hoping his open heart opens more doors for travel writing.